For anyone seeking nourished radiant skin. When you consider that the purpose of a lotion or cream is to deliver oil to the skin, body oils make a lot of sense! Made in New Hampshire. Restores, balances, and nourishes skin. For anyone seeking nourished radiant skin. When you consider that the purpose of a lotion or cream is to deliver oil to the skin, body oils make a lot of sense! Gentle, soothing, and nourishing, Badger body oils are made from simple, whole, organic plant oils, so they’re naturally good for your skin and suitable for all skin types. Treat your skin to the soothing power of nature’s most precious oils. 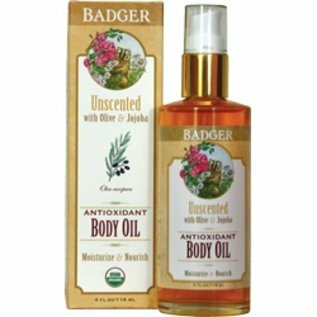 Unscented Body Oil with Olive and Jojoba is gentle enough for even the most sensitive skin; leaving it radiant and smooth. Absorbs quickly, is non-greasy, and glides easily over skin’s surface. *Helianthus Annuus (Organic Sunflower) Oil, *Simmondsia Chinensis (Jojoba) Seed Oil, *◊Olea Europaea (Olive) Fruit Oil, *Punica Granatum (Pomegranate) Seed Oil, *Rosa Canina (Rosehip) Fruit Extract, *Hippophae Rhamnoides (Seabuckthorn) Fruit Extract, and CO2 Extract of *Calenduls Officinalis (Organic Calendula).